I suspect 100 percent of you know what a tunnel is. But cool pic. This is the northern part of the Crenshaw/LAX Line under Crenshaw Boulevard — specifically the section between Expo/Crenshaw and Leimert Park Station. can we get more of these folk at macarthur park? that station is sketchy as all hell & terrifying..
@metrolosangeles three Santa Monica bound trains and no #BlueLine this last train was empty. Ours is gonna be packed. What's up with that? @metrolosangeles I reiterate the importance of a timed transfer b/w Orange and red lines. It makes a difference. This last one is a bit of a tough issue, given that the parking lot at Dodger Stadium Express is vast and traffic is going every which way after games, especially the big ones. First, a very significant caveat: there is no actual proposal on the table to begin tolling an entire freeway or entry to a particularly congested part of the region. Over the summer, the Southern California Assn. of Governments — the regional planning agency that most residents have never hard of — has been floating the idea. 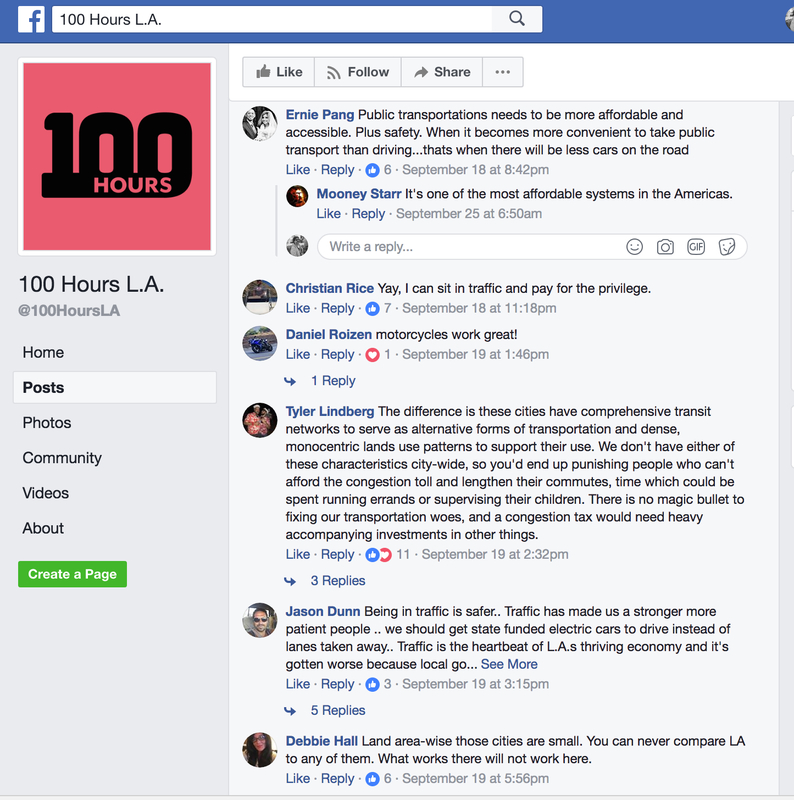 Their big pitch: Angelenos, they claim, are wasting on average 100 hours a year stuck in traffic and congestion pricing would remedy that. The challenge with Los Angeles is that if it suddenly cost, say, $10 to drive through a congested district like Hollywood or Downtown, the region’s current mass transit would hardly be able to pick up the slack. This isn’t to say that Los Angeles isn’t well on its way to giving people more options for mass transit, but the fact remains that we aren’t there yet. As Matt writes, London used $s from its congestion pricing to improve bus service. So there’s that and, as Matt notes, Metro is in the early stages of restructuring its bus system. But which comes first?! I’m not sensing any great appetite for congestion pricing outside of The Urbanist Echo Chamber and I’m not sure how much more appetite people have for more taxes or tolls. Transpo-wise, voters went for the Measure M sales tax increase last year — which is a good thing — but now we’re facing a 12 cents per gallon gas tax increase on Nov. 1 and a big vehicle registration fee increase, too. Could congestion pricing come to our region? Sure. But my hunch is that we’re more than a few years away and the number of transit projects, the frequency of transit and capacity of transit will have to vastly improved first. The best explanation I have is that management is simply uninterested in making the decisions necessary to bring their technologies up to speed. Given their (real or imagined) sense of being constantly under siege, transit agency leadership would prefer to just keep the existing system working as it does today: Better safe than sorry. And the repeated complaints of one board member, not backed by others and not likely to raise the concerns of the political official who appointed him (the governor), simply doesn’t matter enough. As Yonah writes, money is certainly an issue, too. Although it’s not like transit money is growing on trees elsewhere on the planet. Or maybe Americans — who manage to mangle a lot of people in cars — feel that transit is already far safer and safe enough. Which is kind of a low bar. The New York MTA has been removing some subway seats to increase space on crowded trains and reduce the time it takes to load/unload riders. We certainly have some crowded trains at peak hours here. What’cha think? Would fewer seats fly here? Comment please. Steve – I travel the Metro every day, most days at peak. Often I find myself standing in the area near the door and there’s nothing to hold on to! I’m 5’9″, and lots of people are shorter than that and would find it even tougher. So…what would be really great is some extra hanging plastic handles installed, hanging from the roof. They’d be pretty cheap, wouldn’t take up much space when they’re not needed, and you could install them without cutting out any seating. Your forum rules prohibit links, but you can search “subway handles” on Google Images if you’re unsure what I mean. Most times when people are turned away from getting onto the train, there may actually be some room *somewhere* in the carriage, but people who aren’t near the door don’t move in to make room. One thing that would facilitate people moving in to use more of the available space would be additional handles. Hey — that’s a good suggestion. We’ll put it in our weekly report of comments from riders/readers that goes upstairs to the various departments. In New York, subway riders are often referred to a Straphangers from the leather loop straps that used to hang from the ceilings of older subway cars for the use of standees. They now have metal loops for standees to hold on to. There is even an advocacy group called Straphangers Campaign(see https://www.straphangers.org/issues/) advocating for better subway and bus service. Per the Straphangers website, the MTA is planning to retrofit one L train with fold-away benches that lock into place during rush hour for a more complete sardine can effect, the Daily News reports. As for the LRT cars, I would think that adding poles as well as plastic loops near the doors would be a good idea. There should aslo be poles as some riders may not be able to reach loops hanging from the ceiling. Even if there is no transit alternative, with congestion pricing you wouldn’t pay to sit in traffic, some people would drive at other times, or rearrange to not need to drive there at all. I don’t know why carpooling isn’t being touted here, it would save people money on the congestion toll and reduce traffic. Waze’s new carpool feature is pretty good. needs more open space on the train, especially for the light rail (blue, expo, green, gold line). It’s very crowded on the light rail during peak hours, and there’s no room for riders who travel with their bike. So in order to increase capacity, taking seats off is an option, plus also should consider aisle-facing seats to maximize standing capacity. Were you ever able to track down how the toll lanes revenue is spent by Metro (outside of covering the operating costs of the toll lanes)? I don’t think toll lanes are a good on their own, but if the profit from the toll lanes was used to build additional rail infrastructure, I think that a lot of people would be happy with that solution and it would be an easier political sell for Metro. My concern is the recent proposal to use the excess revenue to fund new toll lanes, which makes it seem like Metro views toll lanes themselves as a laudable goal. Thanks Steve! It looks like there is $10 million+ in net revenue from the 110 each year. I wonder if the Board would direct that revenue stream to the Vermont Avenue line, which is in the 110 project corridor. The additional revenue could significantly accelerate that desperately needed project. I think before Metro starts thinking of removing seats they should start with running 3 cars at peak hours on ALL lines, run quicker headways and provide better preventive maintenance so the system will not breakdown as much during peak hours. I know some lines already run 3 cars (Blue/Expo) but I have yet to catch the Gold Lone during peak times running 3 cars. I used to ride it on a daily basis and quit because of this. Now I take one of the 4 buses that run down Colorado. Don’t have to fight the sardines, bicycles are on the bike rack and not at the doorway, always have a seat, don’t break down and run on schedule. BTW, I have been riding the bus for 11 years for when I need to go somewhere the train doesn’t. Still haven’t seen any deputies, etc. patrolling the buses as you see on the trains. Re removing seats: In 1964 St Louis Car Co, the leading rapid transit car builder at the time, issued a booklet of their car designs. One called the Shuttle had no seats but many poles & straps, and its walls folded up like an accordion (or the doors of 1950s GMC ‘Old Look’ buses). It was intended for short-distance, heavy lines, like the 42nd St Manhattan shuttle line. I gave away the booklet, so I can’t send a copy.